Carl F. Hanneman’s college pharmacy notebooks and study guides from 1924 and 1925 have been donated to the Department of Special Collections and University Archives at Marquette University in Milwaukee. The material was turned over to the university and accession papers signed May 26, 2017. It was a long road for the college pharmacy materials, kept by the senior Hanneman at homes in Wisconsin Rapids, Janesville, Fond du Lac and Mauston. When Carl died in May 1982, the papers went to his youngest son, David D. Hanneman (1933-2007). Now, more than 90 years after they helped Carl become a registered pharmacist, the papers will be preserved by Marquette. Carl earned his licensure in January 1925 after completing Marquette’s short course in pharmacy. He went on to a pharmacy career that spanned nearly 60 years, much of it behind the counter at the Mauston Drug Store. The handwritten notes are unique because Marquette previously had little documentation of its popular short course in pharmacy. The university’s degree program in pharmacy was discontinued during World War I because so many faculty and students left campus to fight overseas. The pharmacy degree program was never restarted, but demand continued for higher education to help students pass that state pharmacy board exams. 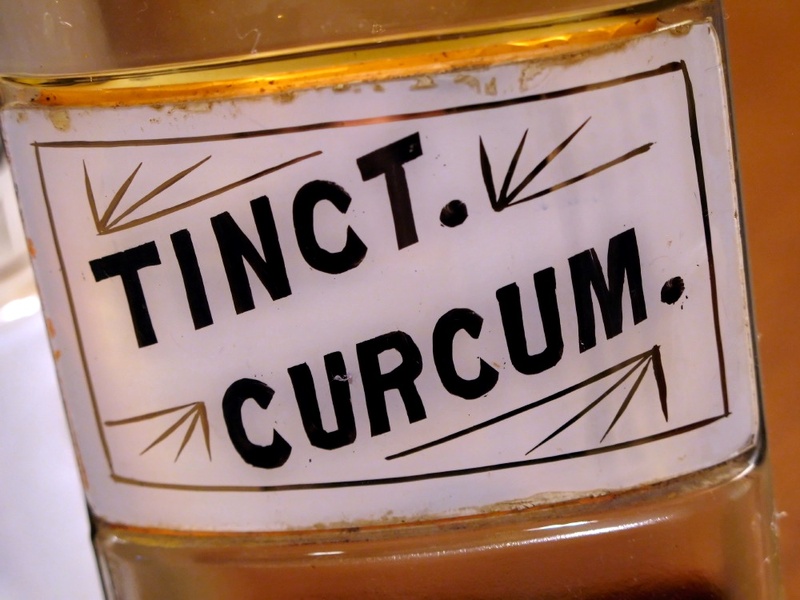 In 1923, Marquette began offering a “short course” in pharmacy under the auspices of the College of Dentistry. The courses in chemistry, organic chemistry, pharmacy, pharmacognosy, toxicology and drg identification were rigorous. They were taught by Dr. Hugh C. Russell and Professor Frederick C. Mayer, both former deans of the Marquette College of Pharmacy. The two-semester program was designed for young men and women with pharmacy experience, in preparation to pass the state exams. The books Carl left behind contain hundreds of pages of meticulous notes on chemistry, pharmacy and related subjects. Two of the books have Marquette pennant stickers on the front. Carl’s pocket-size copy of the Guide to the Organic Drugs of the United States Pharmacopœia has a Marquette University seal on the cover. His exam book shows he scored an 82 percent on one test in 1924. Carl (1901-1982) would no doubt be tickled to know his college work will be preserved in the archives of his alma mater. We think his son David would be rather proud, too. – Read more about Carl F. Hanneman’s Marquette days. This 1916 pocket formulary book has the Marquette seal on the cover. Carl Hanneman took meticulous notes. Two of the hardcover notebooks have remnants of Marquette pennants. Carl wrote his name and home address inside his notebooks. Carl drew pretty good illustrations in his pharmacy notebooks. Relief for chest and head colds. The essence of wintergreen that wafted out the windows onto Division Street in Mauston, Wisconsin. Bottling and selling hand-crafted mosquito repellent at taverns and resorts across northern Wisconsin. Filling pills behind the pharmacy counter as a child. In this installment of audio memories, Dave Hanneman (1933-2007) remembers the work of his pharmacist father, Carl F. Hanneman (1901-1982). This interview was recorded in mid-November 2006 at St. Mary’s Hospital in Madison, Wisconsin. Carl F. Hanneman printed his own labels and wrote the ad copy for Stay Off. 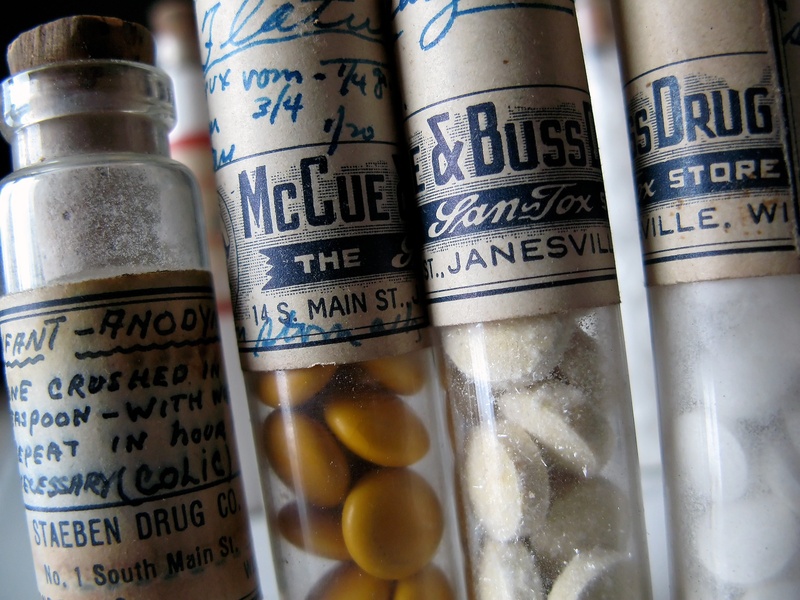 Vials from a portable druggist kit owned by Carl F. Hanneman. 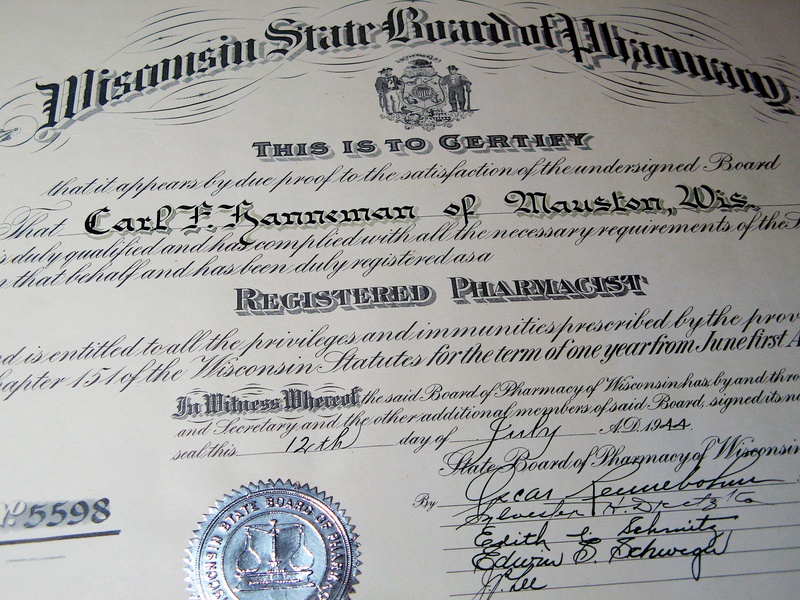 Carl F. Hanneman’s 1925 state of Wisconsin license as an assistant pharmacist. Dad with parents Carl and Ruby Hanneman, and dog Cookie. More than 60 years after it was first used to ward off mosquitoes and other pests in central Wisconsin, the lavender and citronella scent of Carl F. Hanneman’s Stay-Off bug repellent still lingers across time. The Mauston pharmacist invented his own blend of essential oils that provided a natural defense against biting pests, and he sold the product across the area for years. 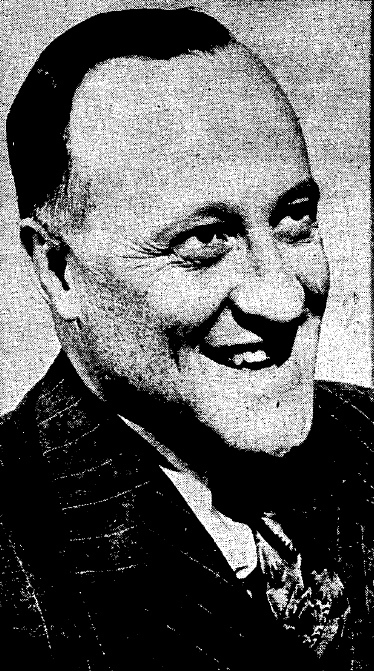 Carl F. Hanneman sold his insect repellent at bars and bait shops all over central Wisconsin. Carl Hanneman’s inspiration for his product came from his need for extra income, and his knowledge of chemistry and pharmacology. Even in the depths of World War II, when rationing made it difficult to obtain raw materials, Carl found a way to make Stay-Off and sell it at taverns, bait shops and resorts all over the area. Due to an abundance of lakes and rivers, Central Wisconsin is known for proliferation of mosquitoes and other flying pests during tourist season. “His being a pharmacist allowed him access to some of the compounds needed to make this stuff,” recalled Carl’s son, David D. Hanneman. 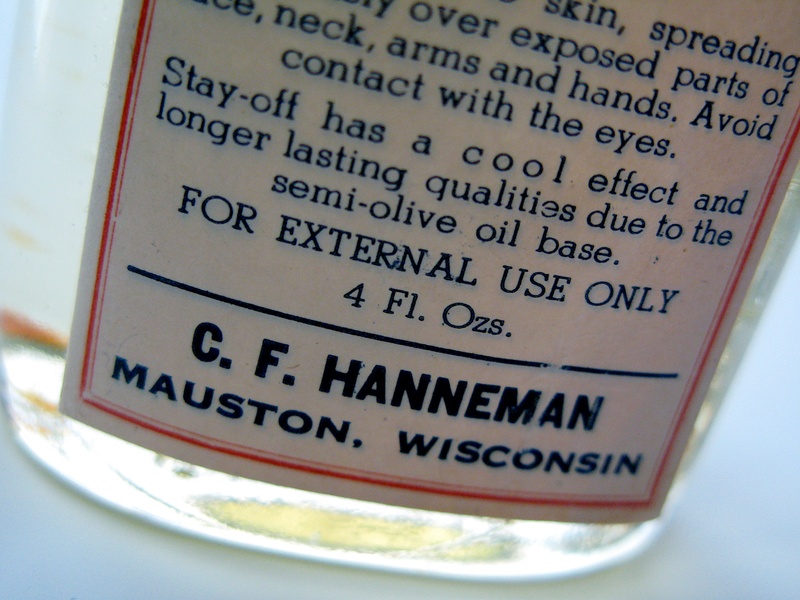 The topical elixir, which used an olive oil base and a secret recipe of lavender, citronella and other essential oils, was often mixed on the back porch of the Hanneman home in Mauston, Wis. “It was kind of comical,” David Hanneman said. Carl F. Hanneman printed his own labels and wrote the ad copy for Stay-Off. Carl wrote his own marketing copy to help sell the 4-ounce bottles of Stay-Off. 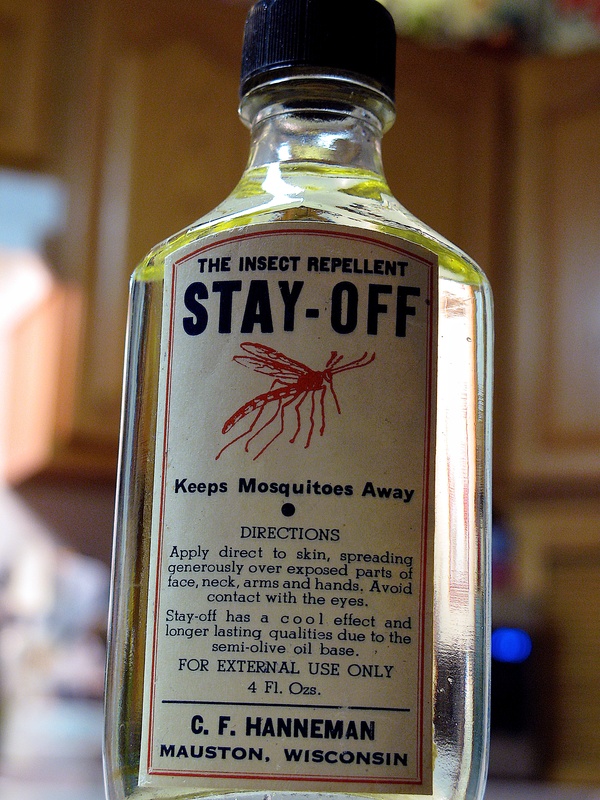 “Stay-Off is not only an excellent insect repellent, but has that cool, soothing and refreshing feeling on hot summer days,” he wrote. “It is highly recommended for women and children’s skin, producing a soft tenderness due to the semi-olive oil base.” The lotion soothes existing bug bites and provides protection against strong sun rays, he wrote. The recipe for Stay-Off called for making the mixture in 1 gallon batches. A half-gallon of Stay-Off and several 4-ounce bottles survive to this day. All of the ingredients are still commercially available. So even 60 years after it was first mixed, it would be possible to make more Stay-Off using Carl’s old recipe. My grandfather, Carl F. Hanneman, was a pharmacist for nearly 60 years. One of the treasures he left behind was a portable pharmacist’s kit in a leather satchel. The many glass vials are still filled with various pills and powders he dispensed to patients at pharmacies in Fond du Lac, Janesville, Wisconsin Rapids, Mauston and Sun Prairie. 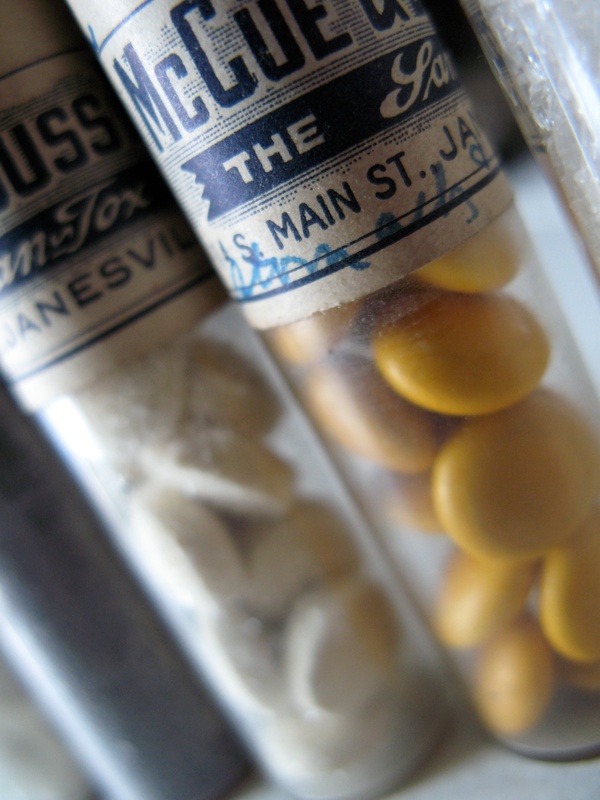 The oldest of the prescription vials dates to 1926.